6 How to check POF Lottery Draw Result 2019? Today 20 TK POF Lottery Draw Result 2019 Published! 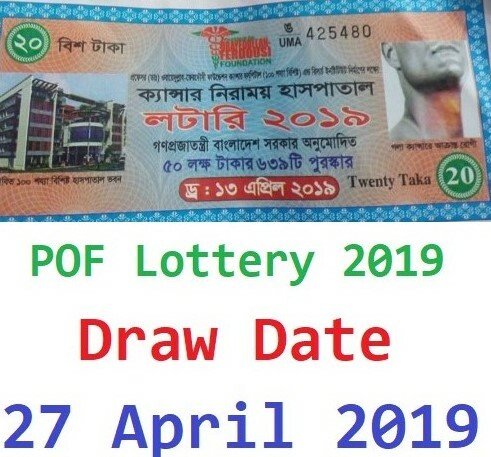 Welcome to POF Foundation Cancer Hospital Lottery Draw Result 2019 Bangladesh. Professor Dr. Obaidullah-Ferdous Foundation Cancer Hospital and Research Institute has started selling POF lottery 2019 from 17th February, 2019 and last date is 4th April, 2019 for 20 million Taka for the purpose of funding cancer. Professor (Dr.) Obaidullah-Ferdousi Foundation Cancer Hospital and Research Institute have provided 75,000 lottery tickets by Bangladesh Krishi Bank for the construction of a 100-bed world-class cancer relief hospital for the poor, who can treatment low cost of cancer, to ensure free health care and free health care. News Update (14/04/2019): POF Lottery 2019 Official Draw Date is 27 April, 2019. There are many ways to check the Professor (Dr.) Obaidullah-Ferdousi Cancer Hospital and Research Institute Lottery Draw Result 2019 and their name is SMS, magazines News and on our website. So, bookmark our website and check every day. POF Lottery 2019 sales were officially inaugurated on Sunday at Mohammad Akram Khan Auditorium of National Press Club. Health and Family Welfare Ministry of Health Services Division Asadul Islam inaugurated the program. In order to provide free and on-the-kind treatment to cancer-affected patients in the country’s distressed and marginalized population, Professor Dr Obaidullah-Ferdousi is working to build a non-profit 100-bed hospital in Pikkandi area of ​​Gopalganj and name is Obaidullah-Ferdousi Foundation Cancer Hospital and Research Center. Today’s modern era, which is why we get all kinds of information even at hand, so now it does not have any kind of trouble to buy lottery. You can buy through your mobile phone’s Dial. Just type in your Mobile message option POF And Send it 16329 number, it’s time to buy your lottery. After buying your lottery, your return number will be written in the company’s return message. Please keep this message carefully. Because you will have to do this with the following activities. At the cost of Tk 50 lakh including first prize of Tk 30 lakh, there are 639 prizes. The draw of lottery will be held on 27 April in Dhaka. The price of each POF lottery is only 20 Taka. How to check POF Lottery Draw Result 2019? Instructions have been issued to the lottery to be sold from 17th February 2019 to date 4th April 2019. The date of the lottery’s draw is scheduled for 27th April, 2019. You can find lottery results through mobile SMS, through online, through magazines and on our site. Be the first to know the result of the draw of drawers first of all. Thanks for staying with us a long time and visiting Professor (Dr.) Obaidullah-Ferdousi Foundation Cancer Hospital and Research Institute Lottery Draw Result 2019 Content. If you have any question about the POF Foundation Cancer Hospital lottery Result 2019? Just comment here, we reply as soon as possible.